Last month I accepted a part-time position as a student Art Instructor for the Higher Ground Neighborhood Development Corporation. Higher Ground is a nonprofit organization that provides elementary education and support to youth and County Education offices throughout the East Bay. My work as an Art Instructor is part of the Afterschool programming component. I help to encourage the creative artistry of youth in the 6th to 8th-grade range. At present, I am working in 9-week intervals at two schools. Once this 9-week period is over, I will move on to another two. Needless to say, I spent most of last month on the development of lesson plans, researching art suppliers, and prepping for my first round of students. I am excited about the opportunity to share my love for art with young people whom have shown an enthusiasm for creative expression. So far, I have been impressed with the overall level of talent displayed by the students I have encountered. Our first official week of programming begins next week and I am looking forward to meeting many more. Now that I have my schedule with Higher Ground pinned down it is time to get back to writing. I have already penciled in some dedicated time for writing and am looking forward to digging my heels in and pushing forward on When We Pray: 8 Meditations on the Aesthetics of Prayer and the Spiritual Life. The completion of this project will be the fulfillment of a lifelong dream; to have my own words and images combined into a book format! I am entirely too close to give up now! This will be the first of many! BE ON THE LOOKOUT…next month I plan to give everyone a few teasers by sneak-peaking excerpts from a few of the chapters along with their accompanying illustrations! Once my manuscript has been completed, I plan to begin searching for a new studio location. If you know of any places that I should check out, please email me directly at: info@damonpowell.com. I have been working on making sure things are in order for my vending at the various art and wine festivals throughout the Bay Area (see right panel for the schedule) setting up a consistent studio schedule and looking for reasonable part-time employment. Money is tight, the vending circuit can be grueling, and I need to stay focused on the creation of additional images. Anyway, I began researching the theme and collecting reference images for the creation of my own memento mori about 6 weeks ago. In July First Friday was extremely packed and lots of people were in the studio. A woman began speaking with me about my work and inquired about my interest in submitting an image proposal for a project at the next Burning Man. I said sure and took her information to follow-up but didn;t really think much of it. the following week I reached out to make contact and was eventually sent a packet of specs and other information about how to complete my submission for the project. I initially saved the email but didn’t open any of the attachments to look at them because I was too busy with some other projects and the deadline wasn’t until August 3rd. 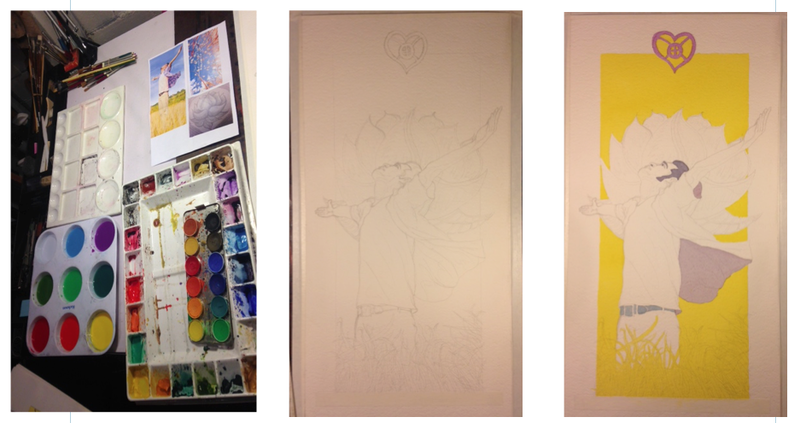 In the interim, I completed the canvas prep and worked up a suitable sketch for the memento mori project. Once the sketch was up to standards I decided to complete the image in scratchboard and mocked it up on a nice new piece of board. Last week I took a break from sketch-searching (my own new word for sketching and researching) to go through my emails and look at the specifications for the Burning Man submission. It turns out that the project is focused on the creation of a South American style pyramid themed around the Day of the Dead. I immediately thought about how I could use the Memento Mori project I was working on and create a small mock-up version to submit for the Pyramid project. I usually complete some kind of small mock-up n preparation for a new project anyway so the whole process was fitting right into my normal work flow. Talk about synchronicities! All of these random slices of events and impressions came together in order for this to happen. This is what life and the willingness to maintain a connection to spirit is truly all about. This is a reminder to keep following my intuition, listening through meditation and prayer, acting with assurance that guidance is always available, and being willing to follow-up and do the work! So mark your calendars and get ready to join me at my first Burning Man!! Memento Mori color mock-up sketch. I will still be completing my own Scratchboard piece of this image (with a few modifications) in the coming weeks so be on the lookout. When I post the completed image I will provide my usual breakdown with regard to the image’s meaning and symbolism – so be on the lookout! Although this image has flowered recently, the nights of reflection and debate that planted the seeds for its creation go back almost 20 years. Seeds that were planted during my second semester at seminary where I received my initial exposure to the writings of Dr. James Cone, the parent of Black Theology. That seed was then watered by the writings of Gustavo Gutierrez, the parent of Latin American Liberation Theology, and fertilized in the fruitful soil of ongoing theological debate and reflection. I find both ironic and appropriate that I have given birth to an image of Jesus so close to the season in which his birth is celebrated throughout the world. For some this birth means nothing – and for others everything. The most practical and pertinent questions have nothing to do with whether or not Jesus ever existed as an actual person, is he the son of god…and everything to do with his contemporary relevance in a world where his presence (real or otherwise) has made a lasting impression. There are so many differing voices and factions claiming possession of Jesus that it’s extremely difficult to discuss his relevance to the current state of affairs, until we ascertain “whose” Jesus we should be talking about? God of the Oppressed is a visual response to this question. The nature of representational imagery necessitates the use of smaller, individual images (image begets image). 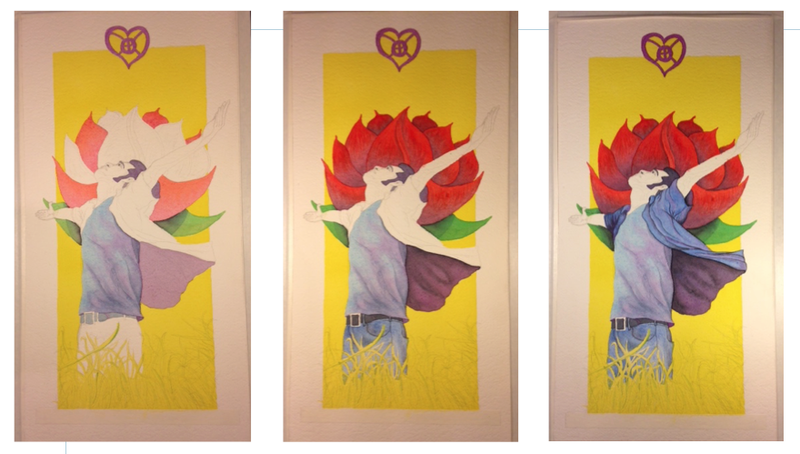 The smaller individual images within the overall composition were carefully selected to support the overarching theme, “God of the Oppressed”. In the process of supporting this theme, I have placed the images together in ways that detail or elaborate upon certain aspects of the theme while simultaneously reinforcing or supporting the other images around it. In this way, their interdependence mirrors our own interdependence. The Asian male with his hand raised in defiance counter-balances the outstretched arm of Hitler behind him. The handcuffed figure in the prison garb is directly connected to the silhouetted figure behind bars – yet both are directly linked to the police officer firing his gun as he holds the dangling head of yet another victim…we go on and on this way as we circle our way around the entire composition. My point with this effect was to remind us that despite all our futile attempts to deny our interdependence, each of us is connected to one another in myriad ways. The injustices we exercise upon another have an effect upon us, them, and the whole of humanity. The central theme within each of these texts is the emphasis upon liberation from oppression, suffering and injustice. Not only liberation from, but more importantly solidarity with those whose lives are being affected by injustice. Solidarity from a divine intelligence that feels what they feel, hears their cries and provides comfort in the midst of unjust and often hostile circumstances. A divinity that not only identifies with us in our brokenness but also promises to take concrete action toward justice on our behalf. These actions are not solely focused upon comfort for the soul but are grounded in concrete historical reality. There is no “pie in the sky” or promise of future glory in the hereafter. These are the actions of a being who walks with us and works on our behalf within the context of our present reality. Freedom and justice are to be struggled for “now” because they are pertinent to our physical experience. These texts present us with a divinity that is filled with compassion and actively concerned with justice. A god who not only takes sides but exercises a preferential option for those who are oppressed. This is a divinity who cannot be contained or co-opted by the establishment. A creator who loves us all, but is willing to not only take sides and become proactively involved with our efforts to balance the scales of justice. That is why these texts lie at the core of my personal theology and are intimately connected to every other aspect of this image. The image of Jesus serves as the central figure within this illustration. He is surrounded by a mandorla like shape which is also representative of the fish symbol that the early church appropriated to depict their faith and mission. I intentionally made sure that the figure not only breaks through the mandorla to touch the other figures but the tail portions of the mandorla also connect with the outer figures as well. This helps unify the composition and create a direct physical connection between the Jesus and the figures that surround him. I also opted to make use of the traditional halo surrounding Jesus’ head. Both symbols indicate spiritual light and power that is being symbolically transmitted to the other figures as it connects them to Jesus. The silhouette upon the cross at Jesus’ feet is not only his cross but the cross of all those who are suffering from oppression – yet continue to engage in the struggle for justice and equality. From my perspective, the real question is not about Jesus, but “whose Jesus?” The Jesus of the oppressor never was and never can be the Jesus of the oppressed. The establishment has its own Jesus. He is not a person of color. He is not a Jew. He is not concerned with justice or equality and would never condone any kind of rebellion or insurrection. He is a wimp. His only interests are sentimental love and helping to maintain the status quo. Whose Jesus are you walking with? My emphasis here is upon the person of Jesus as opposed to the risen Christ of faith. A Jesus who was born as a person of color into a minority community that was experiencing multiple forms of oppression. A Jesus who was: poor, stood up to a corrupt religious establishment, established his ministry by serving those who were considered the least within his community, was trapped by his enemies, abandoned by his inner circle, brutalized by the authorities, and ultimately tried and murdered by an oppressive government. This is the Jesus who has stood by my side, labored with me in my struggles and knows me in every aspect of my humanness. This is the Jesus with whom I identify. This is the God of the Oppressed! Recent events in my life have led me to the contemplation of hope. It just so happens that life has been moving along at its own steady pace. Sometimes intense and other times slow, but thankfully there have been no major upsets or crashing waves. When things are like this I often find the breathing room needed to catch my breath and connect more deeply to my higher self. It is during the steady rhythm of life that I am more easily able to reflect upon life’s deeper layers and connect with Spirit from a much more grounded place. These times of recollection and reflection usually start with gratitude. I find myself grateful for the periods of sunshine that burst forth from the heart in the seasons between the storms. When I am quiet, I can observe a kind of in-gathering within my mind and spirit as all the myriad pieces of my identity are gently de-fragmented and reconnected to one another. I review the progress I have made, see things moving forward, and am filled with gratitude. But even more than that – I am filled with hope. I am able to see the bigger picture and all the small but progressive steps that let me know I am moving forward towards my goals. This acknowledgment fills me with hope. Hope that that I can succeed. Hope that I can achieve my goals. Hope that I have and can make the right choices, and hope for the future. Hope is foundational and inspirational. The bible reminds us that, “faith is the substance of things we yet hope for, the evidence of things not seen.” Most of us focus upon faith in this passage but the statement clearly places an even weightier emphasis upon hope – as the foundation which makes faith even possible. Without hope, life has no meaning. Without hope, faith is not possible. Without hope, there is no vision for the future. From this perspective, hope could best be defined as an assurance that the things we desire are actually capable of becoming reality. Thus my stepping back to acknowledge my progress. express gratitude for my current place, and celebrate my accomplishments fills me with hope. I began this blog because people who view my works often inquire about the meaning within my imagery and the symbols I employ. Since a great deal of my work is about spiritual insight and visual metaphor, symbology plays in integral role in my creative process. Lately, visitors to my studio have also begun asking about my medium, techniques, and the ways in which I am able to integrate them into my overall creative process. So I took the time to snap a few photos of this work in various stages of my creative process. Everything starts with an idea or inspiration. It may be something I see, a spark gleaned from something I’ve been reading, an image or feeling that is impressed upon me within my meditations…but things keep coming so I just try to remain open. Once I have solid grasp upon the concept, I begin doing sketches and/or looking at various images that may help to translate my inspiration into concrete visual form. This particular image had a rather long germination which began last winter while I spent 2 months viewing a package of subliminal message videos I had purchased. The actual composition came together quickly after I began researching images. I am an extremely visual person and an artist so I often save random images that speak to me. While watching one of the videos, the image of the young man standing in the field struck me so I saved it. A few months later I was on google images (I just do that sometimes) and the grassy knoll just kind of popped out at me so I saved it as well. A month or so after that, I was at work making myself a cup of tea. I pulled the last tea bag out of the box and I saw the image of a lotus flower on the inside so I ripped the box apart and took the image to my studio so that I could digitize into my image library. Shortly after that, I was sitting in my studio sketching. I was feeling really good and reflecting upon how well about things had been going and I got this very full, glad, hopeful feeling. I began to try and sketch it – so I pulled up a few images from my image library to see if anything might create a few more sparks and these three spoke to me. As you can see from my initial thumbnail sketches it didn’t take long for me to come up with a workable composition. There are days and weeks when it doesn’t come this easily and I may spend weeks researching, or end up producing 20-30 thumbnail sketches until I can find an inspiring and workable composition. Once I have a good composition, I will often produce 2-3 larger ones (4 x 6) to work out some of the light and shade problems. For this image, I didn’t feel the need to do so. I moved directly to creating some small color roughs. The circled Image with the double stars is the color combination I decided upon using. With an extremely complicated image, I will create 1 or 2 larger-scale color roughs (4 x 6 as well) to alert myself to any potential tonal problems that may arise before I get into the actual process of execution. For me, getting down to the actual work of creation is also an act of worship, and ritual. This aspect of my vocation involves the use of several rituals that I employ to move me toward concrete acts of creation. Creativity necessitates form. An idea or concept is no better than a daydream until you give it form through acts of concrete physical manifestation. Just as “faith without works is dead” inspiration that are not accompanied by acts of manifestation die shortly after conception. Keeping the above in mind, I often let the work itself determine the medium from which it will be manifested. At some point during the sketching stage, the imagery begins to inform me about which medium would be the best vehicle for this particular expression. In this case I knew the colors needed to be bright and vibrant so scratchboard was not a consideration. Once the color roughs were completed, it became clear to me that watercolor would be a better medium since the white paper beneath would produce a much brighter, ephemeral, and luminous quality than I could achieve with acrylics. I begin by engaging in prayer, and then slowly and mindfully laying out my materials so that they are easily accessible and functionally placed within and around my work area. I then choose my material (in this case watercolor paper), and outline the image upon the surface. I often us a projector for larger layouts rather than drawing everything out by freehand. In this case, I used a thinner sheet of paper than I normally prefer to work with (I prefer 300lb Arches watercolor paper), so I had to size the paper before I could begin any actual painting (many artists don’t lay out their imagery until after sizing, but I prefer to do it beforehand). Before I begin to do any creative work I spend at least 10-15 minutes in prayer and meditation just before I begin. I created a small altar in my studio that contains candles, incense, crystals, a bell, and other items of significant personal value. After completing my meditation, I spend about 2-3 minutes with my Ipod selecting what (if any) music will be playing for that particular creative session. With Winds of Hope I began by painting the first layer of washes upon the largest areas of the image. Although it is not depicted here, each area of color has anywhere from 5-8 thin layers of color upon it. 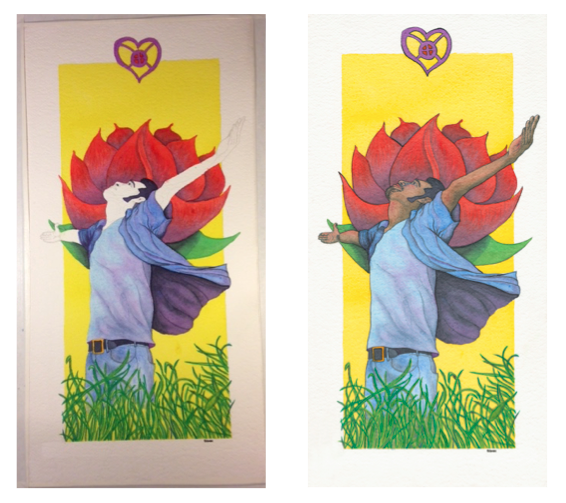 This technique allows for the vibrancy of the colors to reflect up through the paper as each successive layer builds upon the next. As you can see from the images below, the vibrancy of the colors slowly builds intensity with the application of each successive layer. The more subtle details and shading are added in as each layer of color is applied. For me, this process is more like sculpting than painting. I often imagine myself pushing, pulling and molding the various surfaces and contours of the image rather than drawing or rendering them with the paint brush. As you can observe from these photos, I save the more precisely detailed portions of the image for last. In this instance, it was the waving grass and the figure’s skin tones. These final details were part of my work activities on days 5-6. Sometimes, I will initiate changes to the image based upon insights or promptings that come to me during my preparation meditations. For this particular piece, there were no promptings over the course of the process, but once the work was completed several people pointed out that the figure resembled me. This was not a conscious decision on my part and I honestly hadn’t noticed (oftentimes, we do more than we can know or say). The piece was unveiled in my studio for the First Fridays Art Murmur without the facial mustache and goatee, but after the 7th or 8th comment about the figure resembling me, the following day I removed it from the frame and added the mustache and goatee so that the figure would resemble me more closely. 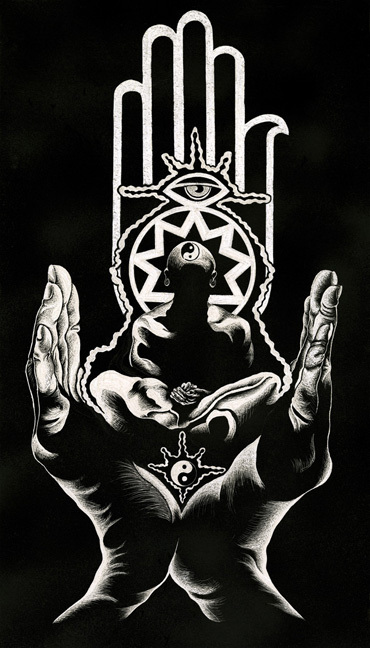 There are only two actual symbols in this image: the lotus flower depicted behind the central figure, and the West African Adinkra symbol floating above them both. The work’s title, “Winds of Hope” embodies the notion of Hope being the wind which blows through mind, body and spirit, filling us with renewed determination, enthusiasm, courage, and willingness to sacrifice for the creation of our dreams. Hope is the literal wind beneath our spiritual wings. The figure lifts his head toward the heavens and opens his arms wide to be caressed by the spiritual winds of Hope in a display of gratitude for blessings already received. The lotus behind the figure is also indicative of hope as it springs up from the muck and mire of muddy riverbeds to show forth its splendor. The Adinkra symbol floating above the main portion of the composition literally symbolizes Hope in West African symbology. I thought it very apt and appropriate that hope is connected to the heart’s symbol. For hope too is about the heart – it’s dreams, passions, and desires. Purple is indicative of spiritual power and love, red passion, and yellow symbolizes wisdom, happiness, and divine benevolence.